Today we look at Herriman's contributions to the Sunday May 12 1907 LA Examiner. Up top we have the first sports cartoon Herriman's done in awhile. 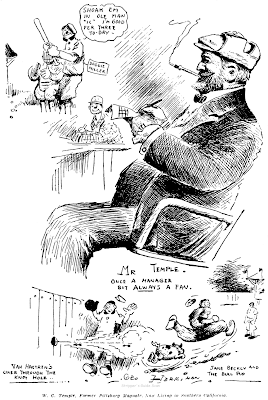 Here he gives us a sketch of W. C. Temple, the retired former owner of the Pittsburgh Pirates. Temple's main claim to fame is that he created one of the earliest post-season championship major league baseball gimmicks. He had the top two teams in the (then single) league battle in a best of seven series after the end of the regular season. The winner of the series got possession of the Temple Cup. This forerunner to the World Series was short-lived, for reasons you can read about in this excellent article. Herriman's second offering consists of one last set of Shriner toons. 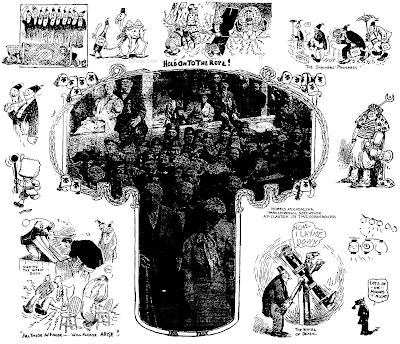 These cartoons appeared as part of a full page color fare-thee-well to the befezzed partiers. Sorry if the image seems awfully small, but that's cuz it started out so darn big! A Girl Scout with big expressive eyes and a pet cat she rescued from a garbage can will enliven newspaper readers soon. The format: Comic strip or one-column panel six days a week. The distributor: Lew Little Syndicate (210 Post St., Suite 915, San Francisco, Calif.). Clementine and her cat, Fang, are the creations of Bob Stevens, Mill Valley, Calif., a retired Air Force lieutenant-colonel who has been a free-lance cartoonist for years. Mr. Stevens draws editorial cartoons for the San Jose (Calif.) Mercury-News on a free-lance basis. After studying art at Pasadena (Calif.) City College, Mr. Stevens joined the Army Air Corps in 1942 and won his wings a year later. He was a fighter pilot in the Pacific until the end of World War II, when he became a civilian flight instructor and advertising director of a short-haul airline. He was recalled to active duty in 1948 as a jet pilot and set the world’s speed record in an Air Force F86 in 1950. While assigned to the Strategic Air Command at Omaha, Col. Stevens drew illustrations for the Omaha (Neb.) World-Herald’s Sunday supplements. Mr. Stevens said his six-year old Danish niece, Majbritt Funder, and Sandra Stevens, his brother’s eight-year-old daughter, provided the inspiration for Clementine. Ah! Never seen (or heard of) Clementine, but the above write-up brought back memories of Bob Stevens. I would think he is most famous for his "There I Was..." cartoons for Air Force Magazine. I have the first couple of the books collecting that feature. "Bob Stevens was commissioned in the Air Corps in 1943. He flew just about every World War II fighter the Army Air Forces had except for the P-39. He transitioned to jets and set a world speed record in 1950 in the F-86 Sabre. He later commanded the first Atlas missile squadron and retired as a colonel. In his second career, he was an editorial cartoonist for Copley News Service and his work was syndicated in more than 300 newspapers. He continued to fly his own puddle-jumper airplane. Stevens’ greatest claim to fame was “There I Was ...,” which appeared on the back page of Air Force Magazine every month from 1964 to 1993. It was one of the most popular features the magazine ever published. (See “Aerospace World: Obituaries,” August 1994, p. 21.) Stevens had to be good. His subject was everyday life in the Air Force and, month after month, he laid it before people who had been there and done that. Fortunately, Bob Stevens knew his stuff, and he did not make many mistakes. Books reprinting selections from “There I Was ... ” sported back-cover blurbs with praise for Stevens from such luminaries as Ira C. Eaker, Francis S. Gabreski, Chuck Yeager, and Milton Caniff." Thanks for fleshing out Stevens' bio! Regarding Clementine, it only lasted one year. As with most of Lew Little's proteges, he would have been trying to place the feature with a major syndicate; apparently he could find no takers for Clementine. Here's a gem from the good folks at General Electric. 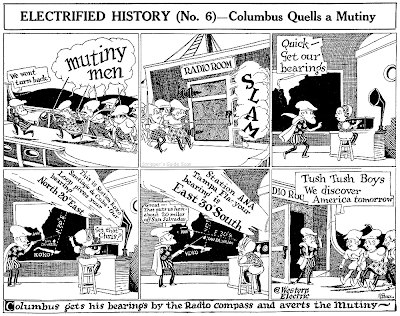 This series of cartoon ads was produced in 1924 by the great C.D. Russell. Russell was at this time well on his way to becoming a favorite in the humor magazine Judge, and almost a decade away from creating what would become his life's work, Pete the Tramp. Thanks to Cole Johnson for sending in these superb samples from the series! Noel Sickles never really had any great ambition to be a comic strip cartoonist, but nonetheless ended up being one of the most influential of the 20th century. Scorchy Smith was an awful Associated Press aviation adventure strip penned by John Terry. 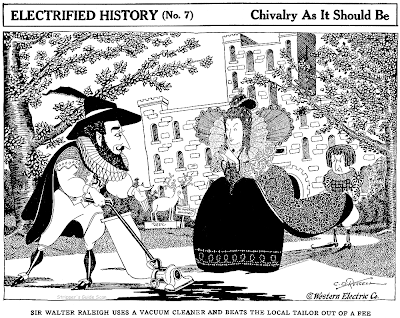 Sickles called Terry the worst cartoonist ever, and he wasn't exaggerating much. 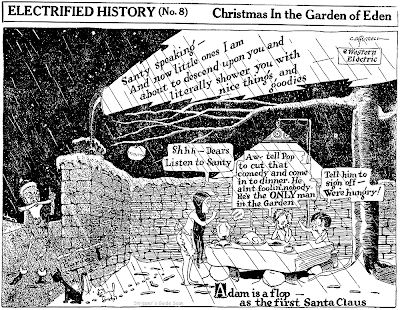 When Terry became ill Sickles was given the thankless task of ghosting the strip in that horrible 'style'. 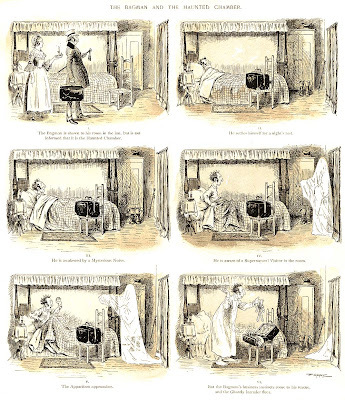 Luckily for Sickles the ghosting period didn't last long, as Terry soon died. 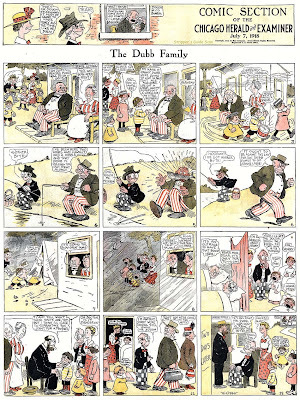 Sickles was then given free rein to experiment, and in the process he revolutionized the way adventure strips are drawn. Sickles is credited with popularizing the chiarascuro technique for adventure comic strips, a style that his buddy Milton Caniff more famously appropriated for his Terry and the Pirates. Sickles experimented endlessly in Scorchy, and this volume shows Sickles playing with various techniques, changing the look of the strip practically on a week by week basis. Little fanfare has been given to Sickles writing talents. He famously disliked the process of writing the strip, and I expected therefore to have a hard slog reading through his entire three year stint. However, I was gratified to find that Sickles' writing was far better than I had been led to expect. His stories make good internal sense, a basic factor lacking in some highly celebrated strips, and one that keeps me from enjoying many adventure strips. His plots, according to essayist Bruce Canwell often loose adaptations of his favorite western movies, are entertaining and solid. His story pacing, especially after he became more comfortable with his assignment, is unhurried and full of little details, a refreshing change from the frenetic pace maintained by much of his competition. About the only oddity in the stories, and I'm surprised that his editors let him get away with it, is that aviation, the raison d'etre of the strip, is noticeably absent. While strips like Tailspin Tommy strictly constructed their stories around flying, Sickles' Scorchy stories rarely use the aviation angle in any meaningful way. Sometimes the only flying that happens is in the segue from one story to the next. The stories are better off, though, because the slavish imperative of sticking to genre makes strips like Tailspin Tommy quite a bore for those not fascinated by wind shear and the latest advances in de-icers. The reproduction of the strips is miraculously excellent if I assume correctly that tearsheets had to be used as source material. The smaller papers that tended to use the Associated Press features seldom had excellent print quality, but the strips here look fantastic. Even the zipatone, very hard to reproduce well from tearsheets, is clear and sharp. I doff my Photoshopping hat to the work of the restorer on this project. The book is a giant, weighing in at a whopping seven pounds. 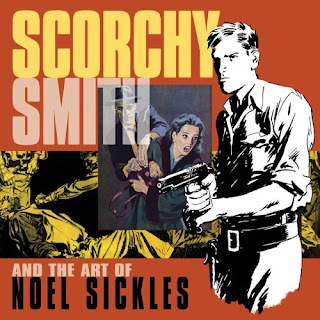 Not only do we get the complete Sickles run on Scorchy (plus a little of Terry and Christman to pad out story arcs) but there is an exhaustive biographical essay by Bruce Canwell. It is accompanied by an incredible array of Sickles work all the way from rare early pieces to his later commercial and fine art work. This section of the book, comprising over 130 pages, could easily have been published on its own to rave reviews from Sickles fans. Thanks for the info. Great stuff! Yeserday (Tues. Nov. 18) a documentary film on cartoonist V.T. Hamlin, creator of ALLEY OOP was finally released on DVD. CAVEMAN: V.T. 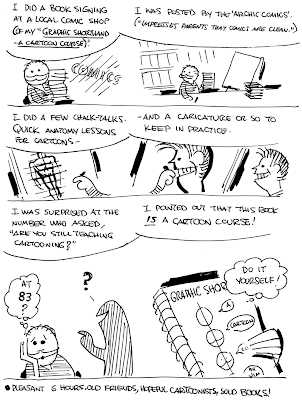 HAMLIN & ALLEY OOP (2005) tells the fascinating story about the life and work of Hamlin and his iconic comic strip, Alley Oop. Please spread the word! As collectors and admirers of the medium, it's important we supportg filmmakers whom invest their lives into immortalizing comic cartoonists of the Golden Age. DVD is available on Amazon.com. Keep up the good work! Your hard work is not in vain and is sincerely appreciated. Have I mentioned that NBM's latest entry in their Forever Nuts series of classic comic strip reprints is Happy Hooligan by Fred Opper? I provided a biographical essay on Opper for the book as well as a number of raw scans of Opper material. You can purchase your copy at Amazon.com. I supplied a great many Opper cartoons that didn't find their way into the book, so here's the final batch of bonus Opper items for you. 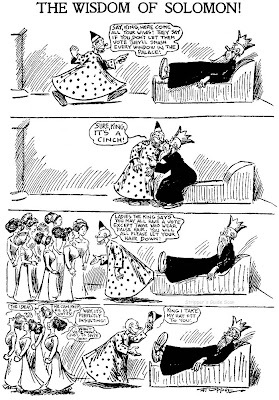 Up top we have a suffrage cartoon from 1912 starring one of the less used members of Opper's repertory company, King Solomon. 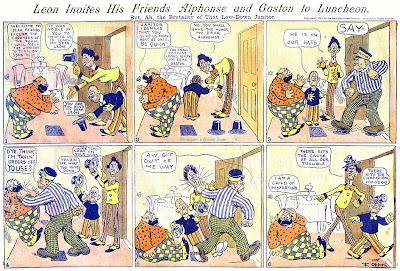 Next are a pair of Puck full-page strips showing just how differently Opper approached his work when working for that magazine. Both are from the early 1890s. 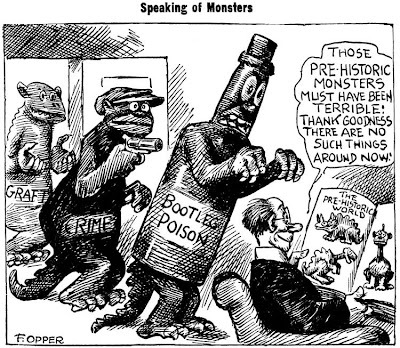 Next we have an editorial cartoon about prohibition from late in Opper's career, 1929. 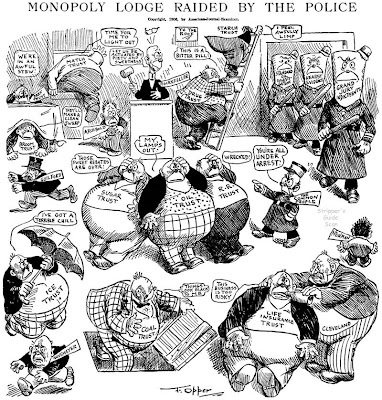 And finally a 1906 Monopoly Lodge editorial cartoon from Teddy Roosevelt's trust-busting days. It's not hard to imagine what T.R. would have to say about our current financial crisis which owes most of it's woes on our government's welcoming attitude to giant rapacious corporations. Those who do not learn from history are doomed to repeat it. 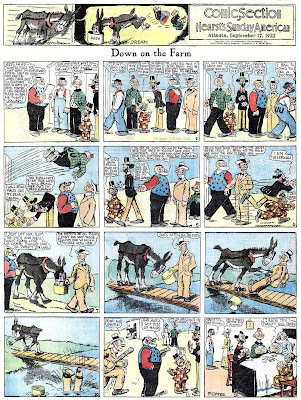 Today we have a 1918 Dubb Family Sunday, an incredible Down On The Farm Sunday from 1925 wherein practically all of Opper's best-known characters make appearances, and a 1904 Alphonse and Gaston Sunday. Glad to hear Jim is still doing appearances. They are ALWAYS worth the price of admission. And as far as teaching at 83, remember 83 is JUST A NUMBER... a big number, but a number none the less. If you feel up to it, do it!